Take your eyes off Dainton Brewery for a second and chances are you'll miss a fair bit. There might have been a rebrand, they might even have dropped "Family" from the brewery name, without a doubt there will be a new beer or two. Or, in the case of our most recent check-in just prior to Good Beer Week 2018, a bit of all three, with the core range now coming in different, bolder livery, the logo morphed into Dainton-meets-Flash-Gordon and a quartet of new or newish beers. Amid the last of these was the brewery's 2018 hop harvest beer, a Wet Hopped IPL featuring hops express delivered from Bushy Park in Tasmania. This hopped up lager pours the palest of pales and, continuing with the alliteration, pours forth passionfruit and peach (with some pesky tropical and grassy hop flavours ruining the flow of p's). There's a fair bit of balancing light malt sweetness and a faintly resinous bitterness in there too. 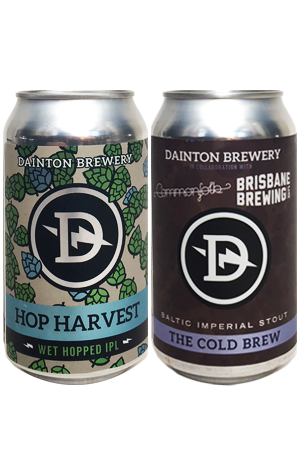 As for The Cold Brew, it's yet another collab by the Dainton crew, an imperial porter featuring Brisbane Brewing Co and coffee from Mornington's Commonfolk. It's sticky and viscous, with a dense, dark brown head and coffee aromas to the fore. Were it not booze (and at 10 percent ABV it most certainly is), it would be an intense, triple shot iced espresso with added fudge.